Lions may be king, but let’s not forget the elephants with five dead from poaching in Kenya last week. The American dentist who lured Cecil from the protection of a national park in Zimbabwe, is reported to have asked for a massive elephant after shooting the GPS-collared lion. Fortunately, the professional hunter who arranged Walter Palmer’s trophy hunt, wasn’t able to find one large enough, so the dentist promptly left Zimbabwe. While trophy hunting is an abhorrent sport, we mustn’t lose sight of the fact that poaching is a much greater problem, and that elephants rather than lions are in the firing line. Elephants are at significant risk from poaching that could see their extinction within the next couple of decades. Their tusks can be sold in Asia for more than $1,000 per pound, according to The Washington Post. The illegal ivory trade is worth $7 billion to $10 billion a year, with markets predominantly in China, followed by the U.S. and Thailand. Ivory is used for jewellery and carvings, fuelling a demand that made it highly lucrative for poachers to kill over 100,000 African elephants between 2010 and 2012. Cecil’s sad story has been talked about the world over, but the story of five elephants, an adult female and four sub-adults has been a whisper by comparison. 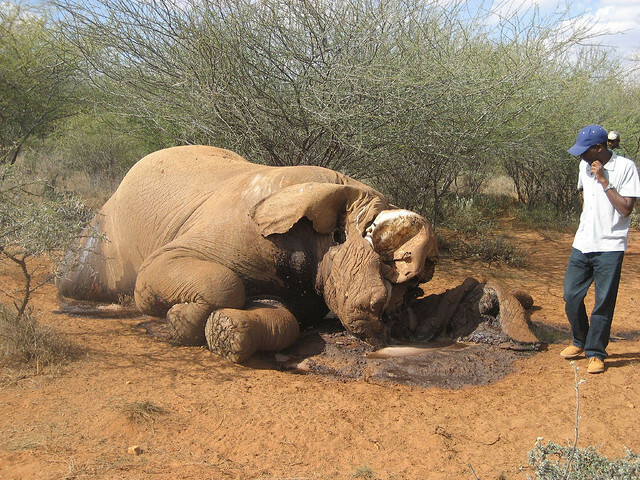 Last week, poachers crossed the border from Tanzania into Tsavo West National Park in Kenya, butchered five elephants for their tusks and escaped before rangers were alerted. Two men so far have been arrested. “The gang is believed to comprise four Tanzanians who operate across the border, assisted by some Kenyans from the local area,” Kenya Wildlife Services spokesman Paul Udoto said in a statement. Kenya lost 164 elephants to poachers last year, including the much-loved Satao whose 2-meter “white gold” tusks were his downfall. Apart from the loss to his species, and to rangers and local people who loved him, Satao’s loss will be felt by the wildlife tourism industry. The Kenyan government has stepped up the fight against poaching with 550 new rangers on the ground last year. With new technology, herds can be tracked using GPS, which alerts rangers to threats based on changes in elephant movement and speed, reports The Washington Post. Kenya isn’t only a target for elephant poaching, but also for smuggling out of Africa ivory that has been poached in other countries. Kenya Wildlife Services has been working with Interpol to identify key people who run the cartels, reports the Daily Nation. A Kenyan elephant population of 175,000 in the 1970s has dwindled to around 35,000 today. The Kenyan government has urged the world to support its anti-poaching campaigns to save elephant populations. During his recent visit to Kenya, President Obama announced his intention to ban ivory trade in the U.S.
“We’re proposing a new rule that bans the sale of virtually all ivory across state lines,” Obama said at a press conference in Kenya, reported in Time. Tighter controls limiting interstate trade to antiques over 100 years old will stop wildlife traffickers profiting from illegally obtained ivory. Trophy tusks will be limited to two per year per hunter where currently there is no limit, although there is a suspension on trophy imports from Tanzania and Zimbabwe. New York and New Jersey states have already banned the selling of ivory, and other states are debating similar bills. The new U.S regulations are aimed at protecting elephants, and the wildlife tourism industry in Africa, as well as helping in the fight against terrorist groups funded by the illegal ivory trade. The United Nations has also responded to the increasing threat of illegal wildlife trade. A resolution announced by the United Nations General Assembly last week asks countries to step up their fight against wildlife crime by treating it as an aspect of organised crime. The UN expressed concern over the steady rise in rhino poaching and the dramatic increase in elephant poaching that threatens both species with extinction. Wildlife trade monitoring group Traffic estimate that around 30,000 elephants are killed in Africa each year to supply the ivory trade. Last year, 1,215 rhino were killed in South Africa for their horns. Elephants are majestic, intelligent, and social animals that form strong bonds and live for around 70 years. They have an excellent memory, able to recognise familiar elephants or people many years after their last encounter. The matriarch, the oldest and largest female, can protect the herd by signaling whether another elephant is friend or foe, allowing the rest of the herd to feed and breed when there’s no threat. Poachers usually kill the older, larger elephants for the size of their tusks, but the loss of a matriarch has significant impact on the herd. Breeding can’t keep up with poaching either. Elephants breed slowly, with a 22 month gestation period, and at least a two-and-a-half year gap between births. Elephants experience a similar range of emotions to humans, including grief, and mourn the death of herd members. In some cases, elephants experience symptoms similar to post-traumatic stress disorder, a study revealed. Grief is expressed in behaviours such as lingering by the carcass, or rolling over and cradling bones with their trunk. Elephants aren’t the only victims of poaching. Last Friday, wildlife organisations around the world celebrated World Ranger Day, held on July 31st since 2007. It’s a day to remember and honour all rangers protecting wildlife, in particular those who lost their lives, as well as those who still risk their lives every day. In Africa, rangers are mostly killed by poachers, but occasionally they are fatally injured by an elephant rampaging on villagers’ land and threatening livestock, crops and human life. Poachers can be local people trying to make a living, but poaching is now mostly commercially driven, involving armed criminals. Protecting wildlife is becoming increasingly dangerous, with a ranger’s skills and tasks bearing more resemblance to those of a soldier than a conservationist. More international funding and co-operation is needed to help train, equip, and assist these brave men and women, as well as to help local communities to live in safety from wildlife. Protecting the world’s endangered species is a global responsibility. President Obama has made a stand, and China is considering an ivory ban, but Chinese public opinion will be much more difficult to win over. If the message isn’t getting through that elephants are brutally and needlessly killed for cultural, aesthetic or status reasons, then perhaps more graphic campaigns are needed in consumer countries. Time is running out. Images of an elephant felled with its face missing, gently nuzzled by its grieving calf would surely change minds. “It is with deep sadness that we share with you news of Losoito’s passing, the little calf rescued from the massacre in Tsavo last week that killed his family. How many more elephants will die like Losoito and his family before the ivory trade is banned?